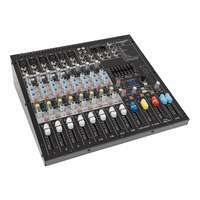 8 Channel (4 Mic Pre's) analog mixing desk with USB audio interface. Featuring On-board Compressors, British EQ, AUX and effects options makes the S8-MK2 perfect for performing musicians and small bands. 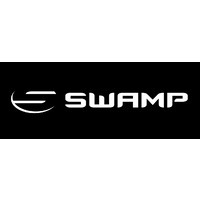 SWAMP impressed the market with original S series analog USB mixing consoles and now follow up with the S-MK2 series, featuring improved knobs and faders, robust design and 19inch rack rails included as standard. 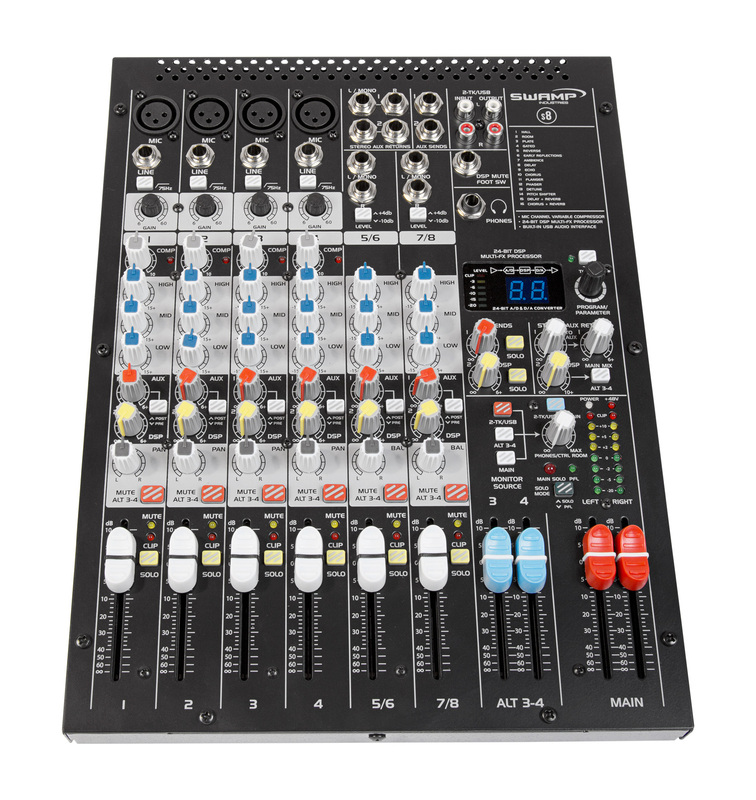 The S-MK2 Series mixers combine excellent build quality, stunning sound performance and a remarkable price to offer unbeatable value. 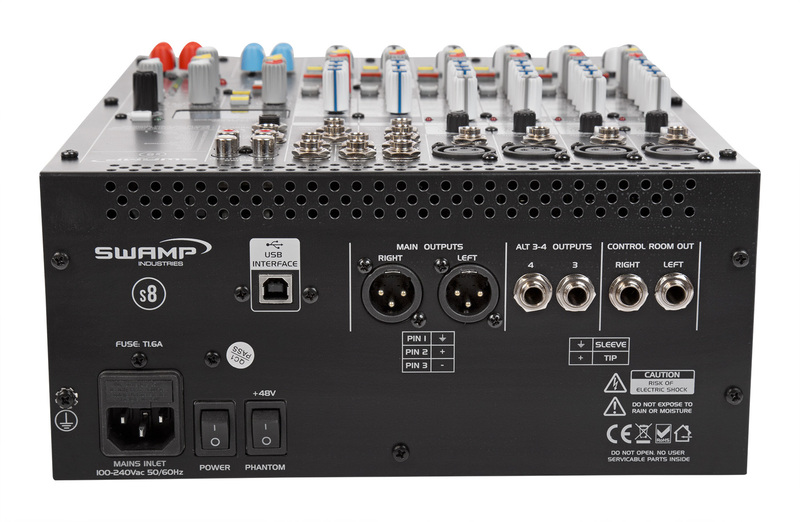 On-board Compressor, EQ, AUX and effects options makes the S8 perfect for performing musicians and small bands. A high quality Stereo USB output enables the S8 to be used with confidence, as a home studio audio interface. 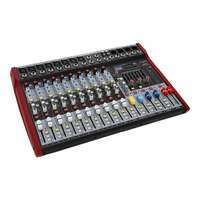 Critical to the performance of any decent audio mixer are the in-built microphone preamps. Featuring carefully designed V+Z preamps that offer undistorted, noise-free gain with plenty of headroom, usually reserved for costly outboard preamps units. This is one place, we will never cost corners on. Each of the four XLR mic channels (1-4) features an in-built, 1-knob compressor that has intuitive threshold, ratio, attack and release presets. Increasing the compression on a channel will lower the dynamic range of the signal and increases it perceived loudness. The loud peaks are squashed down and the quiet sections are boosted. Use the compressor simultaneously with the gain knob for best results. 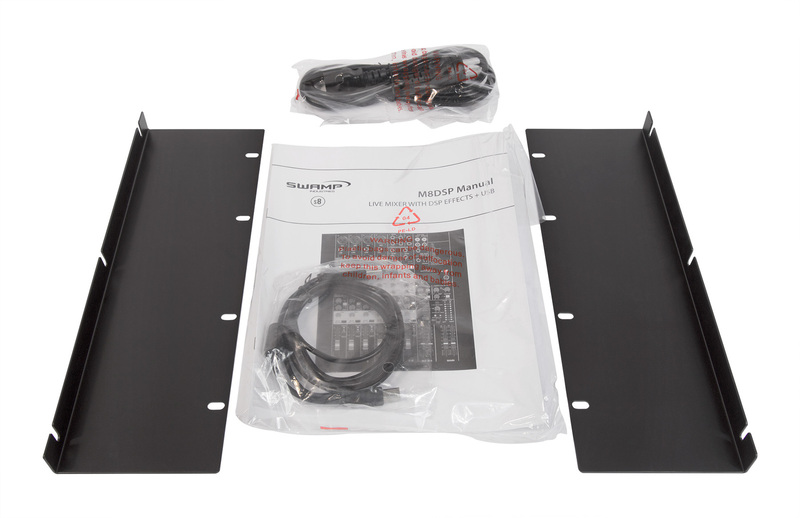 The entire S-MK2 mixing desk series are 19" rack mountable, with the rack rails required included with every model. 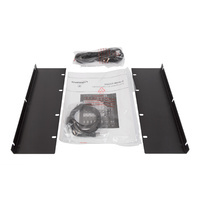 The rack rails simply attach to the side of the mixer with 3 screws already present on the mixer, then it is ready to be placed into any 19 inch rack case or frame. 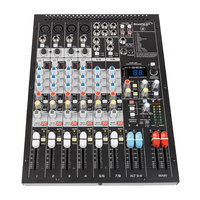 Equipped with auxiliary (AUX) sends, that allow additional "mixes" of channels to be sent from the mixing console to foldback speakers or outboard effects. 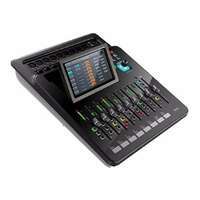 Ideal for creating foldback mixes for on stage performers. With a "Pre" and "Post" option for EACH CHANNEL, the AUX sends are extremely versatile. The FX channel can also be used as a 2nd AUX send. Each channel has an FX control knob that will send the signal to the in-built stereo effects processor. Includes all the classic preset "mixing effects"; reverb, delay, chorus, flanger, etc. Main volume controls for the FX send and return enable you mix the "dry" and "wet" (effected) signals together for optimal results. Standard 3-band EQ with Bass, Mid and High controls. 15dB of level control each way gives the audio engineer plenty to work with. 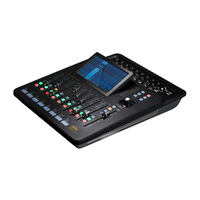 The S-series mixing consoles feature a USB input/output with quality A/D, D/A converters for 16-bit, 48kHz recording quality. 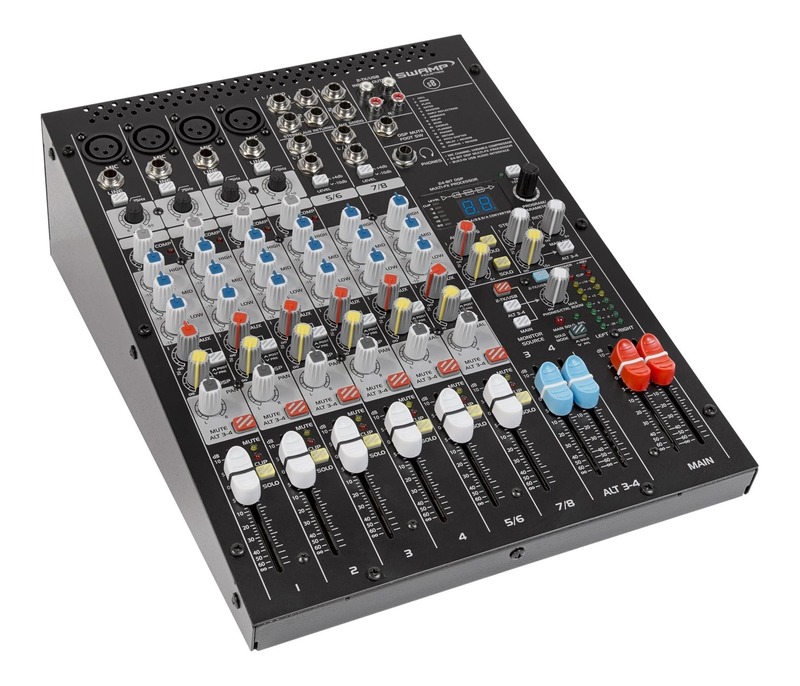 The audio sent to the computer from the mixer is identical to the stereo MAIN MIX output signal. 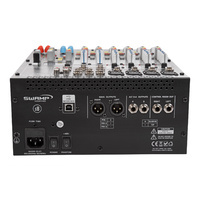 Audio from the computer can also be routed back into the mixer signal path for playback. 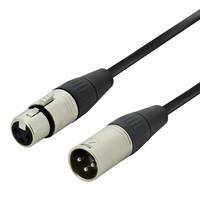 It should be noted that the USB circuit cannot be used to record and playback signal simultaneously. 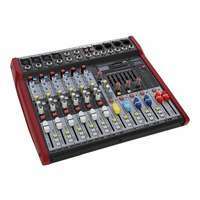 I use this mixer for home recording it does everything I need it to and more. 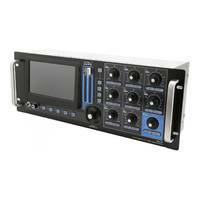 Comes with rack mounts as well and have been very please with the USB interface and the on board effects! Highly recommend this unit! 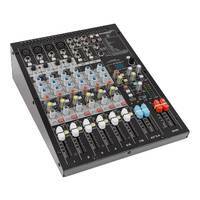 I use this mixer as a sub-mixer for my synth rig, utilising the on-board FX. It does a good job in this capacity, and slots nicely into the set-up.